Son, and successor in Adrianople, of Jacob Yaḳḳir Ghiron. 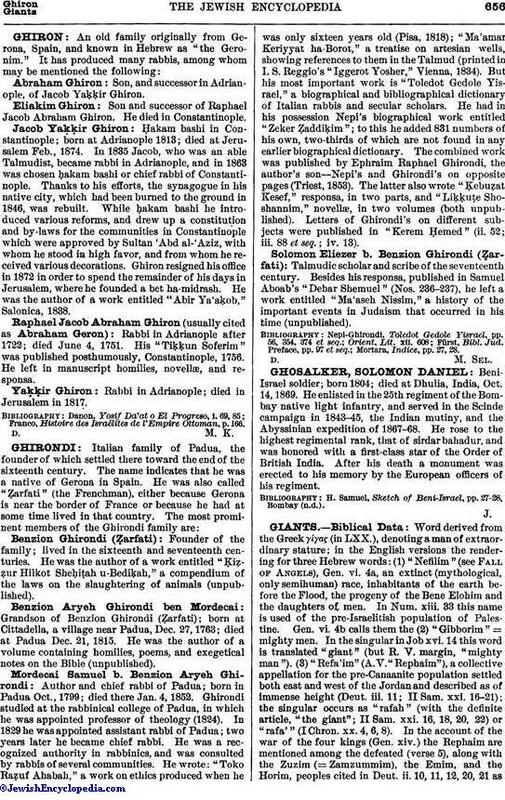 Son and successor of Raphael Jacob Abraham Ghiron. He died in Constantinople. Ḥakam bashi in Constantinople; born at Adrianople 1813; died at Jerusalem Feb., 1874. In 1835 Jacob, who was an able Talmudist, became rabbi in Adrianople, and in 1863 was chosen ḥakam bashi or chief rabbi of Constantinople. Thanks to his efforts, the synagogue in his native city, which had been burned to the ground in 1846, was rebuilt. While ḥakam bashi he introduced various reforms, and drew up a constitution and by-laws for the communities in Constantinople which were approved by Sultan 'Abd al-'Aziz, with whom he stood in high favor, and from whom he received various decorations. Ghiron resigned his office in 1872 in order to spend the remainder of his days in Jerusalem, where he founded a bet ha-midrash. He was the author of a work entitled "Abir Ya'aḳob," Salonica, 1838. Rabbi in Adrianople after 1722; died June 4, 1751. His "Tiḳḳun Soferim" was published posthumously, Constantinople, 1756. He left in manuscript homilies, novellæ, and responsa. Rabbi in Adrianople; died in Jerusalem in 1817. Franco, Histoire des Israélites de l' Empire Ottoman, p. 166.